Pete Ostroski, of Intervale, NH, crosses the finish line at The 39th Annual Mt. Washington Auto Road Bicycle Hillclimb, which was held on August 20st, 2011, in Gorham, New Hampshire. 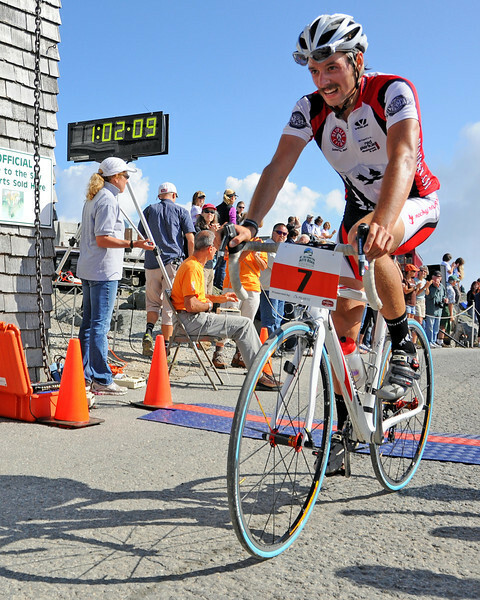 Cyclists raced up the grueling 7.6 mile Auto Road course, to the 6,288' summit of Mt. Washington, the highest peak in the Northeastern United States. The 22 year old Ostroski finished in 8th place, with an official time of 1:02:09.